There are many things you can not prepare for in life but gaining a board appointment is not one of them. So, don't wait to find out the hard way what you should have done to achieve your board aspirations. Take the stress out of your next board appointment and find out how to separate yourself from your competitors. Board appointments are potentially life and career changing. In fact, statistics have shown that people who have Board Directorships in addition to an executive role are: more appointable, earn more, are unemployed less and have better networks and connections. They are also able to future proof their careers better, have more successful retirements and weather unexpected career changes strongly. However, gaining a board appointment is a highly competitive process despite there being thousands of organisations looking for Non Executive Directors each year. It is particular difficult if you don’t understand the way board appointments are made or how to circumnavigate these ‘rules’. For these reasons and many others you should attend the Board Search Breakfast. Register today to secure your Early Bird price PLUS all breakfast attendees can reimburse the cost of this ticket against any membership package. Book today as places are limited and early bird breakfast prices are available. 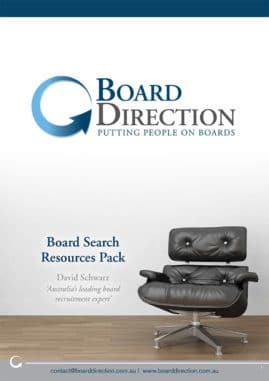 Each and every Board Search Breakfast is led personally by David Schwarz. I am Australia’s leading board recruitment professional. I have over 15 years practical experience gained as an international board recruiter and CEO of Board Direction & Board Appointments (UK). As such, I can confidently say that no one knows more about how to gain a board appointment or develop a board career than I do. Not only have I written the internationally selling Board Appointments Book: The definitive guide to finding and gaining a board appointment, I have personally written 1,500+ Board CVs, have been recognised as a leading board CV writer, been featured in the Financial Review’s BOSS magazine, the SMH, Channel 10's 'The Project' and I present regularly for organisations such as Governance Institute of Australia, Sydney University’s Graduate School of Management (AGSM) and the CEO Institute. I am also a Top 10 LinkedIn user with 26,000+ LinkedIn connections and has advised thousands of clients on how to develop a board career or gain their first board directorship. Register today to secure your Early Bird price PLUS all attendees can reimburse the cost of this ticket against any Membership.